The Quintrex 690 Hardtop is part of the Quintrex plate boat range designed for serious offshore fishing. If you love fishing and you’re looking for a great alumnium allrounder to get on the water, there’s no doubt you’ll love the Quintrex 690 Trident from Brisbane Yamaha. The 6.9m Trident has a suburb ride, a great roomy cockpit and lots of built-in features to make fishing all day a pleasure. Featuring the new aluminium Blade hull from Quintrex, the 690 Trident has the deep V entry at the bow which cuts cleanly through chop with ease and pushes the spray down and away from the boat making it a dry ride even in rough conditions. 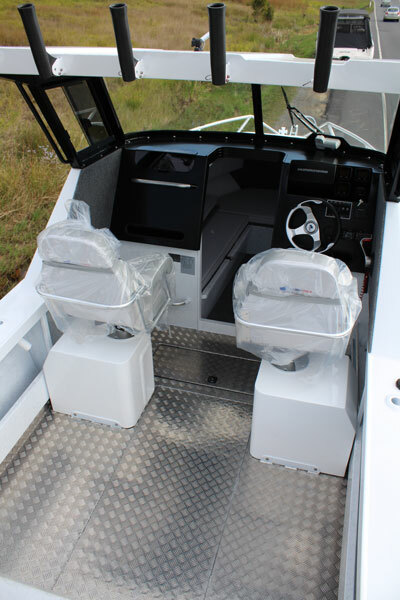 The cockpit is fitted with a newly designed transom-mounted widened and deeper baitboard with cutting board, 5 rod holders, knife sheaf and cup holders and plenty of storage for your tackle boxes and a large area for getting the bait sorted. Also an essential feature for any serious fisherman is the rocket launcher fitted on top of the cabin. It incorporates six Reel Easy folding rod holders which fold down individually with a quick release pin mechanism, making it easy to stow and reach your rods. There’s also a plumbed 135lt underfloor killtank for keeping your bait fresh and within easy reach when the fish are on. There is a clear viewing screen so you can keep an eye on them or you could feel this storage with ice to keep your catch cold. The self-draining tread plate floor with automatic, non-return scupper drainage system offers extra safety and piece of mind in all conditions. The transom door with boarding ladder and grab handle provides easy access on and off the boat, especially if you have kids or have a few years under your belt. There is also a upholstered seat at the rear of the cockpit which can be folded away when not in use and there is also an additional storage shelf behind the rear seat. Tucked beneath and easily accessed is storage for the twin batteries. The side pockets have heaps of room for all the other gear you need when fishing and the layout ensures you can fish close to the gunwhale and still have room for your feet underneath. There is room for two anglers to fish from the one side and the bait board is low enough that a third angler can fish over the top if that’s where the fishing a hitting your lines. The fibreglass built in rodholders eliminates any chance of breakage and will keep your rods secure. The cabin and helm area has been well thought out, with plenty of room to move between the front seats. The seats are marine grade upholstery and slide back and forward to suit. 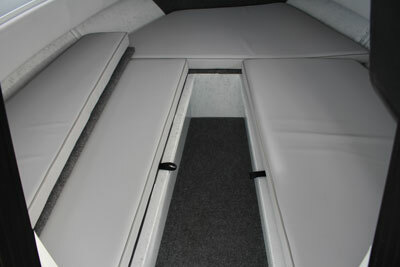 The large open stow away storage area underneath is designed for your tackle boxes, Esky and the like. The cabin features wide wraparound laminated hardened windscreen and sliding side windows with unobscured views of what’s ahead which keeps you dry and protected from the elements and is finished in black to reduce glare when you’re out on the water. The helm area has all the switches and gauges right in front which you really only appreciate when you are at sea in rough conditions and need to keep your eyes on the waves and everything else is easy to see and within easy reach. Quintrex Trident 690 cabin with cushions, plenty of storage, and more. And at nearly 7m in length the Trident 690 gives you a true double berth cabin for stretching out on overnight trips with plenty of head room. There’s additional stowage underneath for your sleeping gear and side pockets for your personal items. The overhead hatch provides ventilation for warmer climates. The 690 Trident has a great use of available space and there’s even underfloor storage for either your Porta Loo or other gear. The Quintrex 690 Trident from Brisbane Yamaha is fitted with a Yamaha 225 V6 four-stroke which is a gem of a motor and offers plenty of power and also gives good economical range with the 200lt of fuel for offshore and long range fishing. Also available in the Trident range from Birbsnae Yamaha is the 610 and 650 Hardtop models. For more information on the Quintrex Trident 690 Hard Top, call the guys at Brisbane Yamaha and ask for a water test today, you won’t be disappointed, tel (07) 3888 1727.